10 Percent Per Month, found at 10ppm.com is an Advisory Newsletter for Options Investors and a trading company dealing in a strategy called Iron Condor. As chancy as trading is, this is a sound strategy and company and we will explain it here. There is much to study before jumping into it. The trading industry is a bit risky, but 10 Percent Per Month has a relatively straight forward and decent trading strategy. Options get a bit baffling so I’ll try and break it down somewhat. If you are a car owner, you buy insurance protection. The insurance company sells it as a premium on a monthly basis. If you don’t get into an accident, the insurance company keeps the premiums you pay. If something does happen and your car is damaged, the insurance company is notified. They then can appraise costs. Options are like stocks insurance. 10 Percent Per Month sells this insurance to stockholders and keeps the monthly premium. 10 Percent Per Month’s strategy is to get out of the situation before the car is useless, to use the analogy. It can be profitable most of the time but they are experienced enough to jump out of the ‘car’ before there’s any serious injuries. This is all thoroughly oversimplified, I realize, but a condor trade is like betting on both sides of the strike price. Big traders do this, and then work the spreads to keep the premium and drain the options of their value. The risk of the actual trades is not on 10 Percent Per Month but on the individual and the market. Thus, it may be difficult to tell whether they can deliver. They most likely do the trades themselves and reflect activities out to the customer. As an education in market strategies with coaching, the $125 per month for a year comes out to 1500 dollars. 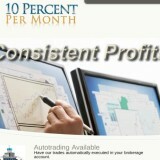 If you get a decent trading education from 10 Percent Per Month then this is a good deal. Primarily, those of you just starting who may not have the 25k it takes to invest should likely start paper trading, or mock trading just to get the hang of it. 10 Percent Per Month has a training system to get you understanding the essentials. Those with twenty five thousand to invest should know that 10 Percent Per Month works quite well for you to be able to naked short the puts and calls. They show you how, and they are good about disclosing their trade record. In fact, they make public at least four years of data showing how they do their trades. They are also honest about months it didn’t work, and there have been some recently, as the market volatility is not always condor friendly. They qualify what they say and the advice is sound mostly for beginners looking to get into a new business. Any claims in the market that say you make the trade and then sit back and let the money grow is dealing in pure hype. This should be familiar information, and 10 Percent Per Month lets you know this up front. There are several platform companies on and offline more capable of meeting the needs of the more advanced traders. Although I have recommended this type of trade to many people, it is a very good strategy, but it will seem advanced to someone new to this field. Again, try to paper trade for at least six months, keep track and check your results. Now, 10 Percent Per Month uses the traditional SPX approach of professional floor traders, but it may not be most advantageous for everybody. Only one trade per month is quite conservative. In this sense, their marketing appears to be a low risk investment strategy but it is up to you to decide if this is for you. Other companies are far more aggressive in their trades. By and large, the SEC considers investment newsletter publishing companies that employ auto-trading as investment advisers. 10 Percent Per Month falls generally into this category. It’s not a basket to put all your eggs in, certainly not on a monthly basis, but it is just for trading capital only, among other investments.